What does packaging mean in the digital world? Like everyone else on earth, my personal and professional life is being more and more influenced by digital technology. It keeps on surprising us with new ways of doing things, some of which threaten to make dinosaurs of established industries almost overnight (ask record shops, or Kodak, or taxi drivers). At first sight packaging seems unlikely to be threatened by digital substitution. It’s a real, 3-dimensional object with tangible functions: to contain, protect and dispense a product. You can’t drink Coke from a virtual can. But in my role as a brand design consultant, this role is often secondary. The primary purpose of our work is to tell a brand story, and in this quest the packaging acts as a media channel, albeit a highly interactive one. For me ‘packaging’ is both the physical object and the idea that it projects. And I believe that our increasing immersion in digital technology is already changing the rules of packaging design. You’re always going to need the can (or its equivalent) to drink the Coke, but when it comes to deciding to buy it, there are plenty of new (digital) ways to achieve that without its physical presence. The supermarket is a product of a different age, developed in a time when cars and TV were the latest technology. The convenience and thrill of driving to a store, stocked with thousands of tempting articles lined up neatly on shelves, has helped keep our economies humming for over half a century. And the supermarket, as beautifully observed by Thomas Hine in his book The Total Package, is ‘the natural habitat of the package’. Packaging designers working for manufacturers, suppliers and agencies like ours, have honed their skills over this long period of symbiosis, to create the vast temples of temptation where we go shopping. With online now taking a 6% share of UK grocery sales, it’s the equivalent of the 5th largest retailer, and we all know which way that share figure is heading. But it’s all happening so quickly that packaging design hasn’t yet caught up. 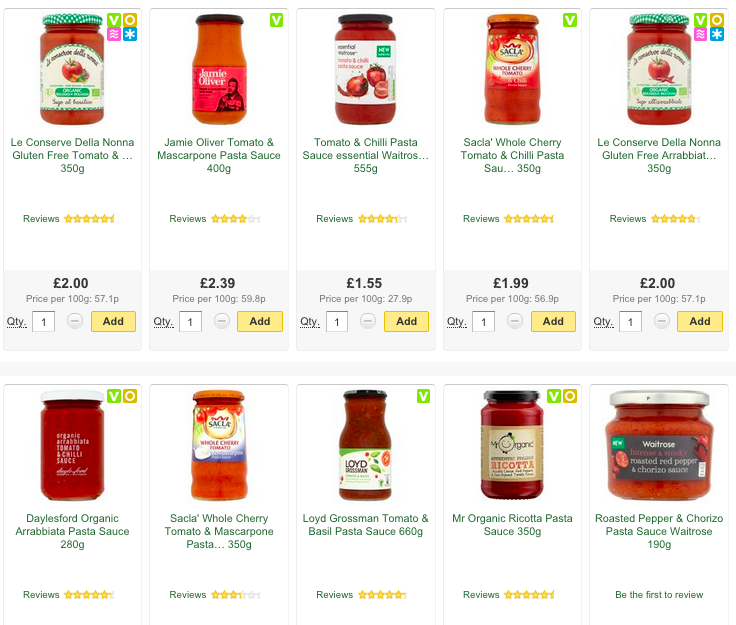 Online grocery retailers simply use tiny images of the ‘real’ thing, presented in a grid system that looks deceptively similar to a supermarket shelf. But a few minutes shopping online quickly demonstrates that this is not like a physical supermarket at all. The concept of merchandising, where products and brands are grouped according to proven models of shopper search behaviour, is strangely absent. 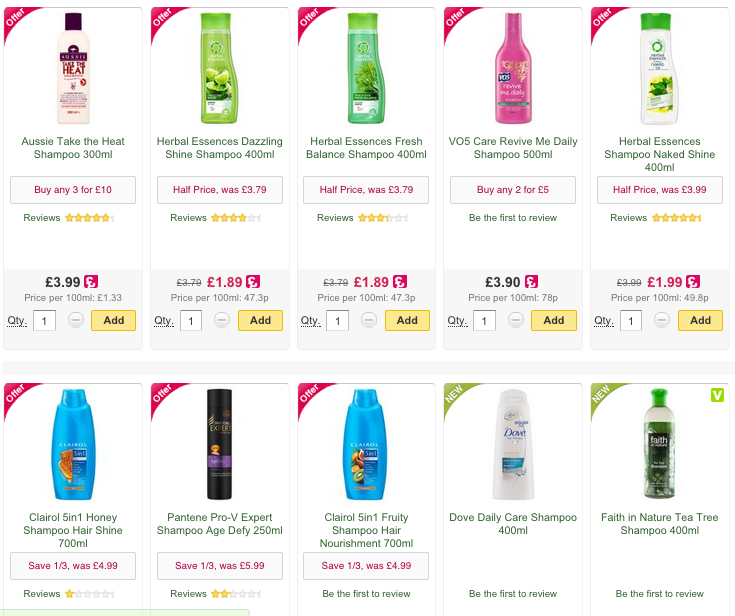 Your range of 10 products may not appear together, or even next to their offline competitors. As a result the ‘repeat value’ of your brand system is missing, and every pack has to fight its own unique battle for attention. Size impression (of the actual pack) is also irrelevant, as every pack gets resized to fit the template. This makes squarer packs seem bigger than tall ones, the opposite of what happens on shelf. The ‘magpie effect’ of shiny foil, or the subtle but perceptible curve of a container’s form, cannot deliver their design intent from a postage stamp-sized image on a computer screen. Beautifully photographed product visuals become largely redundant: At 10mm across they no longer trigger the subconscious desire impulses they were designed for. Online, much of what we think we know about packaging design is wrong. A recent webinar by design research specialists The Big Picture identified just how different the online environment really is. Crucially, we switch our shopping mode from ‘System 1’ (intuitive and highly efficient) to ‘System 2’ (rational and effortful). We have to consciously read the text about size, flavour and price, instead of simply ‘getting it’ via clearly visible packaging signals. In bricks and mortar supermarkets it is estimated that only 30% of purchases are pre-planned, with consumers happy to be tempted by offers and new products that they are exposed to during their visit. Online, with system 2 in charge, the discounts still work but it’s too much effort to consciously seek out new things. And a postage stamp-sized piece of packaging isn’t going to help much. The pack structure (in the sense of its 2D profile) can provide greater recognition and standout, but be aware that white packs of any shape don’t exactly leap off a white page. 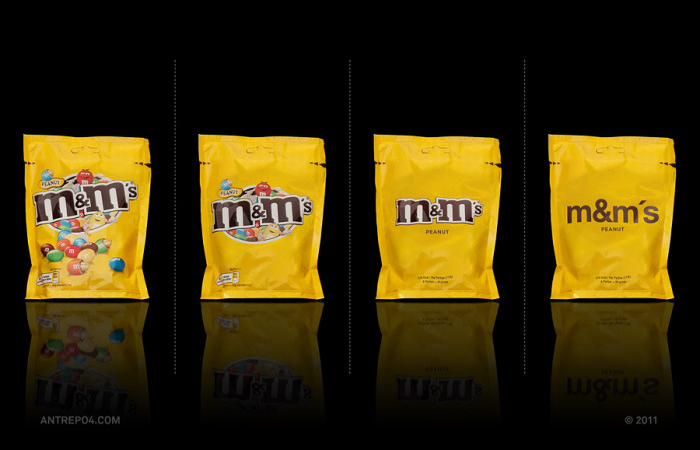 In contrast highly coloured packaging is very impactful, but there’s a watch out: More than ever you need to get the balance right between brand power and variety coding. Pack images that are easily identified as your brand, but which also clearly indicate the promise of the specific flavour, fragrance or benefit of this variant, are easier to buy. 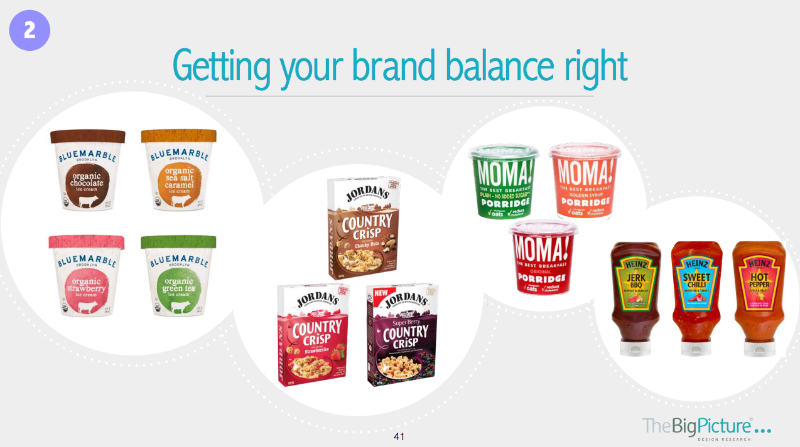 Of course ‘brand balance’ is also a factor in the real supermarket, and those brands that manage this well survive the shrink-ray effect of online images better than most. Taking this one step further The Big Picture suggests brands should consider creating a specific online pack image, simpler and more iconic than the real-life pack. Why not? Global ad campaigns have used simplified, text-free packaging images for decades, and designers have often experimented with reducing a brand to its core visual signature. So where better than online to use such a ‘pack avatar’? In doing so, we would be accepting the (current) limitations of the online pack delivering all that its offline version does, and focus on brand identity and clear product identification. The ‘seducing’ role of packaging would be delegated to a new moment in the shopping experience, unpacking the delivery. And here The Big Picture advise taking this new opportunity to really seduce. After all, your brand has won the battle for being chosen, and now has your consumer’s attention in a more intimate setting, their home. This could radically change the design challenge: From standing out on an overcrowded shelf to being truly useful and memorable in use. And beyond the moment of unpacking, this might lead to packs with a focus on environmental or storage efficiency rather than being first and foremost a Salesman. But of course designers won’t be giving up on that earlier moment of online encounter to engage and seduce. The digital box of tricks is far smarter than that! Those brand avatars aren’t just going to sit there, settling for brand and variant identification. They’ll be finding ways to replace the lost seduction of physical packaging with new digital tricks to do what brands have always done: engage our emotions.